Fish N’ Ting | Eat It, Damn It! Beef prices have been in flux for awhile. 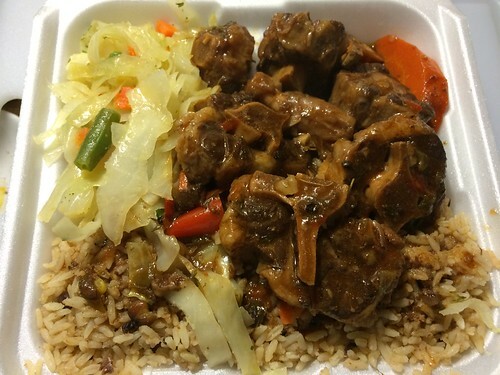 Oxtail is becoming such a specialty item that it is going at higher prices than other cuts of beef. Soon, it will be listed as “Market Price” in many restaurants. I really enjoy my Jamaican oxtail, but if I’m going to be paying premium prices my meal better be on point. Accordingly, I’m wary about trying oxtail at any new restaurant. 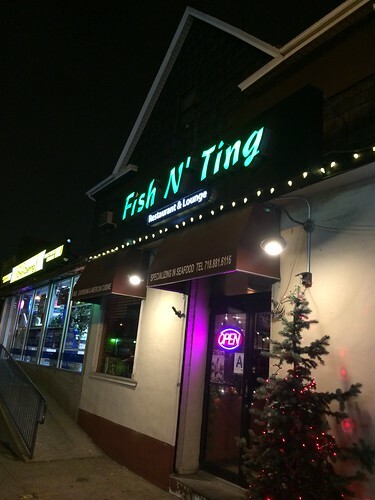 I think Fish N’ Ting has been in existence for two years (maybe a bit more). They are in an area that is dominated by car repair and accessory sales. Nevertheless, the restaurant does not have that oil smell that many places next to auto shops can experience. The seating is ample and there is a nice little bar area. I noticed a little outdoor seating area that might be nice during the warmer seasons. Parking can be a little tough, so if there is rain in the forecast, keep your umbrella handy. This is a medium with rice and peas and vegetables. This was a nice offering. The meat was tender. It wasn’t too fatty, but had just the right amount to keep the oxtails tender and moist. The sauce was rich and thick with a little tang of tomato. The rice and peas were fluffy and flavorful. The pea to rice ratio was just right. The vegetables were nothing special, the usual mix of cabbage and carrots. A medium order was around $15 with tax. It was definitely worth it to satisfy my oxtail craving. While more expensive than other dishes, I did not mind paying the premium. They don’t skimp on the portions and everything was well prepared. I stopped in on a few other occasions and had their Curry Goat (not pictured). Once again, the portions were generous, and the dish was well prepared. The goat was tender and well seasoned. Definitely a worthwhile option. The staff is friendly and the service is quick. They are just off the Connor Street exit of I-95. If you are passing by, Give Fish N’ Ting a try.